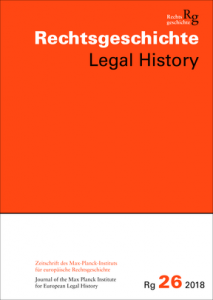 We are happy and proud that our “Before Vitoria” focus in the latest edition of Rechtsgeschichte – Legal History 26 (2018) are out now. There is a consensus among historians that the School of Salamanca brought something new to the development of early modern European legal thinking and methodology. Francisco de Vitoria is considered, not only by modern researchers but also by his contemporaries (from Melchor Cano onward), the origin of the school and its founding figure. He is famously claimed to have introduced Thomas Aquinas’s Summa theologiae as the fundamental text for theological lectures at the University of Salamanca and so prepared the ground for the upsurge of academic activity and intellectual brilliance of late or modern scholasticism at Spanish, Portuguese, and American universities. Regardless of the differences in the assessments of the late scholastics’ political stance (whether viewed as trailblazers on the way to human rights and a modern law of nations or as conservative imperialists, whose sole intent was the perpetuation and legitimation of the Spanish rule in the Americas), Vitoria and his followers are seen as intellectual innovators, opening the restrictive traditions of medieval scholarship to the modern exigencies of a globalized world. This almost universal image has recently been called into question, with Jacob Schmutz showing that Vitoria was not quite the first to introduce Aquinas’s Summa into the teaching of Salamanca’s theological faculty, and Thomas Duve recently asking outright: Did everything actually start with Francisco de Vitoria? Far from being a homogenous group, the School of Salamanca developed incredibly rich debates about juridical, theological, and philosophical ideas, bringing together traditions of medieval scholarship and the new historical dilemma arising from the Spanish conquest of the Americas and the ›discovery‹ of new pagan peoples. Nevertheless, the innovativeness of those debates can only be gauged by studying them from a broad perspective that takes into account not only the well-known medieval traditions but also debates that took place between the authors of the 15th and early 16th centuries, who also saw themselves confronted with the problems of an ever-growing Spanish presence in the Atlantic world. The following three contributions undertake to shed light on this constant and problematic evolution of the reflection about dominium and in fidelity among Spanish theologians and jurists, showing how dramatically the significance of a given juridical or theological topic can change in light of new historical circumstances. They offer glimpses into a close-knit network of personal contacts and academic debates in which important revisions and reconceptualizations of medieval concepts were shaped, both before and after Francisco de Vitoria took up his chair of theology at Salamanca’s university in 1526. The ideas offered here were first presented at the XIV International Congress of the Société Internationale pour l’Étude de la Philosophie Médiévale, Homo – Natura – Mundus: Human Beings and their Relationships, held at the Pontifícia Universidade Católica do Rio Grande do Sul (PUCRS) in Porto Alegre, Brazil, July 24–28, 2017. They were read and discussed in the congress’s special session, The Men of the New World in the Works of the Salamanca Jurists and Theologians / Os homens do Novo Mundo nas obras dos juristas e dos teólogos de Salamanca, proposed by Matthias Lutz-Bachmann from the Institute for Philosophy at Frankfurt’s Goethe University. These papers have been considerably re-worked and expanded for publication.